A beautiful house, a well-kept garden, a placid pond – who does not dream of such an oasis of silence and relaxation. However, house owners and garden enthusiasts know: There is always a molester who spoils the idyll. One example might be green growth. This is the characteristic green infestation on stones, wood or plastic that is caused by plant microorganisms and that does not only disturb the look, but can also attack the material on which it grows. With Caramba’s green growth remover, you can now declare war on this troublemaker. Wherever plants and natural substances play a role, green growth is not far away. Therefore, if you attach great importance on well-kept areas and garden furniture, you should address the problem with green growth. 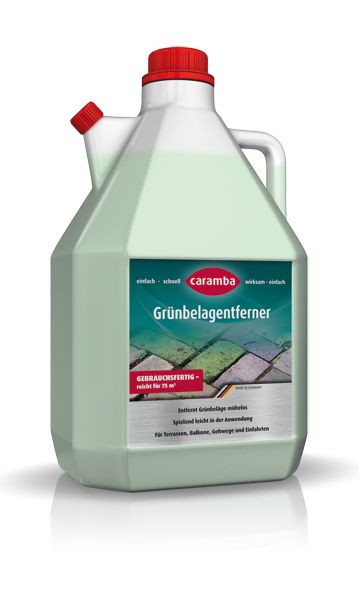 With our Caramba green growth remover this is not at all difficult because this special product works automatically and removes moss, algae and green growth thoroughly from a variety of surfaces. You can use our green growth remover to get rid of green coating from brickwork and roof tiling but also floor and wall tiling and their joints. In addition, concrete, wood or glass can be treated with this cleaner. Therefore, you can use it to clean also your driveway, winter garden or your garden furniture. Moreover, this green growth remover has a prophylactic effect and protects against the recurrence of infestation. This product is no green growth remover concentrate but comes ready to use in a convenient 5 litre package. Spray our cleaner undiluted onto the surface to be cleaned using a spray gun or garden syringe or pour it through the pouring head on the package. Allow our green growth remover to soak for at least 24 hours and then remove plant residues using a brush or broom. Wash off the surface using clean water. Depending on the absorptive capacity of the surface one litre of green growth remover is sufficient for 10 to 15 square metres. Note: Do not use in fish ponds. Does not help against lichen. Always use in dry weather conditions. 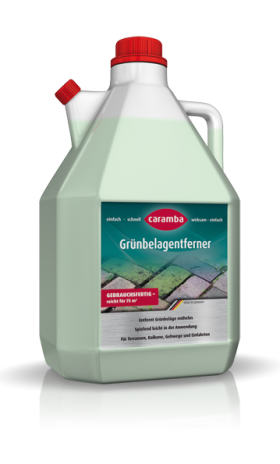 Free your home from green growth – with Caramba’s green growth remover.